With Spring here, we have been re-discovering our outdoor activities and trying new things. My son for years has watched the older kids at the El Dorado Skate park perform tricks and skills. This last month, he decided to give it a try on his scooter. Before I allowed him on the ramps, I made sure to check off the following list. I saw my son go through different stages in the hour he was at the park. From unsure and curious to confidence and building skills. I even saw some of the older kids cheering him on which made him smile and try harder. My daughter didn't care to go onto the ramps but found fun riding her scooter on the flat paths outside the park. Maybe in a couple years she will give it a try. I always thought that kids skateboarding/scootering was a great confidence building fun activity. Now that I see my almost 8 year old son having so much fun, I would like to recommend it to other kids and parents. Looking for a skate park near you in Los Angeles County? Alondra Park Skatepark3353 Redondo Beach Blvd. Avocado Heights Skatepark553 S. 4th Ave.
Bellflower Caruthers Skatepark10500 Flora Vista St.
Boyle Heights Hollenbeck Skate PlazaSouth Saint Louis St.
Compton Skatepark123 N. Rose Ave.
Glendora Skatepark160 N. Wabash Ave.
Long Beach Orizaba Skate Spot1435 Orizaba Ave.
DISCLAIMER: Skate parks can be dangerous and even with complete protection, accidents can occur. 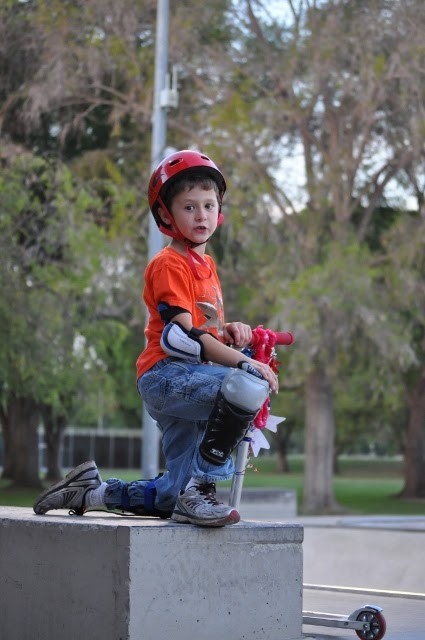 Always wear protective gear and be aware of your surroundings at parks. Great list of skate parks, my son would have a blast at any one of these.